The Federal Highway Administration today approved the use of the federal Transportation Enhancement (TE) grant for restoring the bike path and beach at Surfers' Point. This will allow the project to move forward, although groundbreaking will be delayed until early 2010. 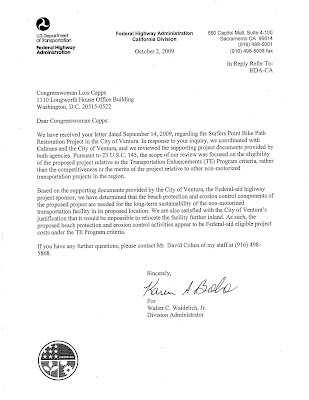 'Based on the FHWA’s careful review of the project documents provided by both Caltrans and City of Ventura, and in response to the congressional inquiry by Congresswoman Lois Capps, attached is our agency decision letter with respect to the eligibility of the beach protection and erosion control components of the above-referenced Federal-aid highway project. Many thanks to Congresswoman Lois Capps, everyone who wrote letters, State Assemblyman Pedro Nava, and all the state and local staff and political representatives who weighed in on this!